You probably noticed we didn’t post on week two because well LIFE. If you have been following along with us for at least a year you’ve probably read all about how moving into a much bigger home, becoming a multigenerational family, and becoming parents has hit us HARD. I know lots of folks here on the internet make it look easy, and I believe for some it might be, for us it has not been! I struggle with postpartum depression in direct correlation with our sons lack of sleep (big surprise huh). You ask why the heck we would join the One Room Challenge then???? Well because we still need to get the Airbnb DONE for lots of reasons I won’t dive into right now (some financial , some personal) . The ORC is a great way to challenge yourself to personal bests and have FUN with other bloggers while doing it. Mitch and I have always been surprised at all we learn over time when we have embarked on this design challenge. Things are tons better than just a few months ago in regards to our son sleeping better and therefore my postpartum depression is on the mends. SO we figured why not try to wrap up this guest suite and bathroom. And then my mom tripped outside and broke her arm (She is the addition to our household that makes it multi-gen) she is a-okay and on the mend as well but DAMN. It’s soooo laughable at this point I mean what what!!! Chill out life! So all the little things my mom helps with that make it so I have time to do projects, write blog posts etc, I’ve been doing again. All the cooking, all the cleaning (okay, okay were not the cleanest household anyways but you get what I mean), running around after a toddler and keeping up with an adorable 8 month old (where the heck did that time go!). So no two week post, and I hope you will forgive me for constantly apologizing for falling short with this little corner of the internet over the last year. I’m so thankful you even spend time reading this stuff. Now that I talked about everything but the project I’ll update you on our tile situation. If you remember I clearly stated we were looking to do a patterned tile with a historic vibe in week One . I’m here to let you know I’m a big fat liar! The only reason I’ve had the chance to write this is because I had to simplify or die y’all. I tried to come up with a patterned Mitch and I both liked and didn’t think our marriage would end over doing. See, Mitch wasn’t interested in a pattern at all, it sounded like a lot of fuss to him. I however, felt I NEEDED to create something unique to inspire our readership. I mean what’s the point in reading a blog about home design if they don’t take this risks so you can see ! And then I had this nasty gut feeling I would be sorry if I forced us into a pattern.Like middle of the night fingers bleeding from setting little individual tiles and having my husband pondering my death- kind of regret. Then, I would be apologizing and stressing and we would be even further behind and more exhausted. And just so I could take a risk on our design? But the house is fairly simple for its time. Other additions (like my favorite feature walls) can always be added for a wow factor and can be removed relatively easy in the future. So we went with a solid warm grey colored penny tile, my marriage is saved, and we can move on to the next thing on this long to-do list! Simplifying projects, our home and to-do list is exactly what we did a few years ago in the "tiny house" , without having done that I don't believe we would have even started this blog. SO, were going back to the basics, everything I get overwhelmed I will try to simplify things in order to create "space" in our lives for us to live healthy and happy.I hope if YOU get overwhelmed and stressed like we do you will embark on this journey. 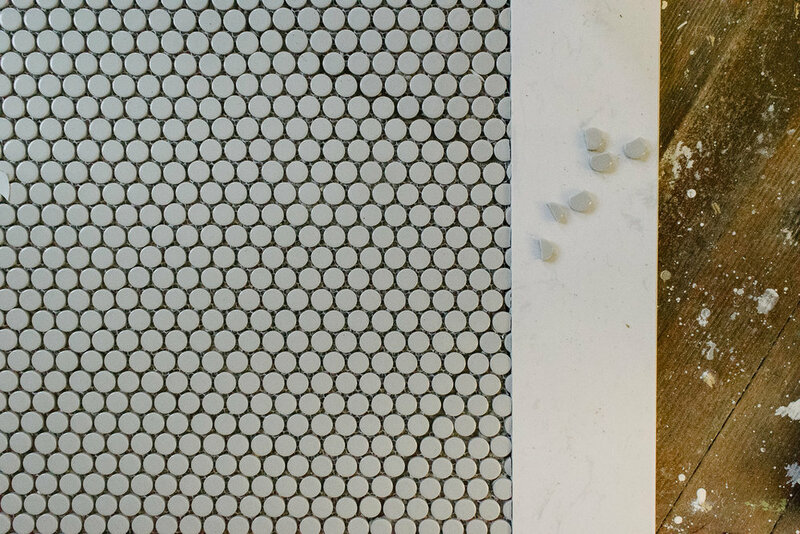 The bathroom tile needed to be done but not with an complicated pattern. The to-do list can get cut from 10 things to 3 today. Just grill the chicken breasts instead of making some elaborate dinner. Our families will thank us for being less stressed and finding more time for the things that matter most. Check out all the other guest participants progress here!